As much as we all like quilling crafts, sometimes its fun to pull out your bin of craft supplies and work on something new. And, if you’re anything like me, you have loads of bits and pieces from past designs that are looking to be used for an amazing project! You never know what may become a treasured family memory. So, I’ve asked some of my online friends to share their favorite DIY ornaments to inspire you. Here are 15 DIY ornaments that you can make this weekend! In my mind, any time is a good time to craft. But, the weekend after Thanksgiving can be the official time to start thinking Christmas. Here are some designs to keep your creative juices flowing! 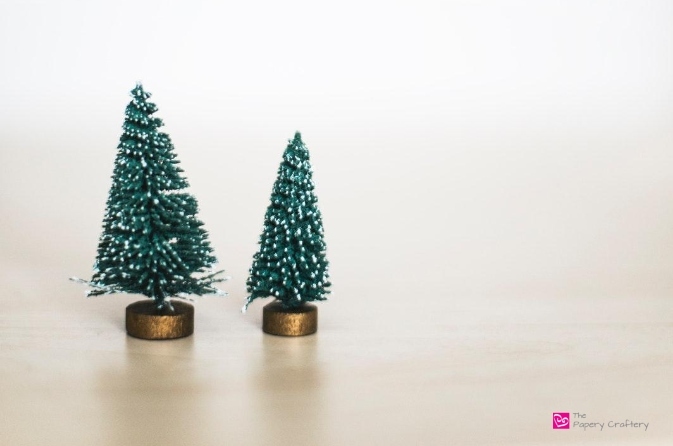 Even your littlest crafters can help with these mini tree ornaments from Crayons and Cravings. How adorable are the button reindeer on Cutesy Crafts’ felt ornaments? Love! Get on the poured paint trend with Exploring Domesticity and these space-inspired baubles. Start saving your empty thread spools to make these personalized wish list ornaments from Natural Beach Living. While you’re in personalizing mode, try this family-themed ornament from The Chaos and The Clutter. Keep those wrapping paper scraps for mini trees like this one from Moms Who Save. I’m really digging the decoupaged Christmas balls that Burlap and Blue dreamed up. Another great way to repurpose paper! I’m sure there are some knitters out there that would love to see Where the Smiles Have Been’s yarn ball ornament on their tree. And I know there are unicorn fans who need an extra dash or pink sparkles on their holiday! Check out this The Best Ideas for Kids post for all the steps. Have sweet memories year after year when you recreate Tikkido’s mini gingerbread man ornament. We have a lot of blue and white snowy scene decorations around our house at Christmas and this little penguin from Messy Little Monster would fit in perfectly. Here’s one that I’ve never seen! Learn how to recreate your kid’s drawings with Swoodsen Says. Rad and The Rest was kind enough to share their adorably quirky dinosaur ornaments. Roar! Is anything more traditional than these orange star decorations by Thimble and Twig? They make me think cozy Christmas! And lastly, for those who have the right tools, check out this farmhouse-style burnt wood ornament by Spaceships and Laser Beams. I hope this quick post encourages you to gather up some crafty bits and create a few DIY ornaments of your own. Of course, if you’re sticking to paper quilling, these poinsettia and snowflakes look beautiful on a Christmas tree. If you do need to stock up on supplies, check out this post with some tips to save you a few dollars! I’ll be back next week with a new quilling tutorial, so stay tuned. And for my American friends, I wish everyone a safe and Happy Thanksgiving! None of the ornament sites would open for me? Please help! I just checked and they work for me. Maybe it’s some sort of privacy setting that you have? If it’s not working, you could always google the original site that has posted the craft your interested in.